Engaging in regular physical activity can have substantial cognitive and academic benefits for children, and is generally promoted for its beneficial effects on children's physical and mental health. Although embodied cognition research has convincingly shown the integral relationship of the human body and mind, in schools physical activity and cognitive activity are typically treated as unrelated processes. Consequently, most physical activities used are neither sufficiently relevant for nor fully integrated into the learning tasks. 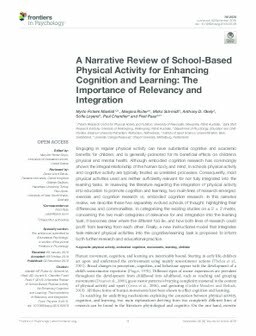 In reviewing the literature regarding the integration of physical activity into education to promote cognition and learning, two main lines of research emerged: exercise and cognition research vs. embodied cognition research. In this narrative review, we describe these two separately evolved schools of thought, highlighting their differences and commonalities. In categorising the existing studies on a 2 × 2 matrix, concerning the two main categories of relevance for and integration into the learning task, it becomes clear where the different foci lie, and how both lines of research could profit from learning from each other. Finally, a new instructional model that integrates task-relevant physical activities into the cognitive/learning task is proposed to inform both further research and educational practise.